Suggested Use: 1 or more tablets at bedtime. Melatonin: It’s mostly in your head, but not entirely. 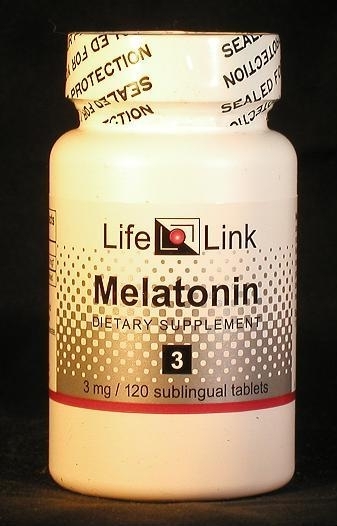 Melatonin is a hormone that plays a major role in regulating the “biological clock” — including the sleep-wake cycle. It is produced in the brain and many other tissues of the body. toxicity from drugs, neural toxins, herbicides, and metals. The optimum dosage of melatonin varies from person to person and must therefore be found by experimentation. Typical doses range from 0.5 to 5.0 mg/day. Let’s look at a few of these applications. Sleep disorders are classified as either “secondary” (i.e., caused by other medical conditions or by drugs) or “primary” (not caused by other medical conditions or drugs). Insomnia is by far the most common primary sleep disorder. Early studies showed that the pineal gland produces more melatonin at night than in the daytime. Darkness itself is the trigger for this increased melatonin production. Eventually it was realized that melatonin is an important component of the so-called “biological clock” (aka “the sleep/wake cycle” or “the circadian rhythm”) — a physiological process that controls the feeling of sleepiness and the ability or need to sleep. Some of the secondary sleep disorders for which melatonin supplements have been reported to be beneficial are: insomnia due to mental disabilities2, aging4, Angelman Syndrome5, or ADHD6; and sleep disruption due to hemodialysis3. As a treatment for insomnia, melatonin has been found to work best when taken twenty to forty minutes before bedtime.26 Doses used in clinical studies range from 0.5 mg to 5 mg. We recommend starting at about 1 mg and increasing the dose over a period of about a week to a level that produces the desired result. Headache specialists have been talking for years about how promising melatonin might be for treating cluster headaches13 — and they are still just talking about it.27 But we don’t need to wait for these foot-draggers to do the obvious thing and run a clinical study — melatonin is cheap and in most countries can be bought without interference from the government or the medical cartel. People with cluster headaches can simply conduct their own personal ‘studies’ and in a few days know whether it works for them — instead of waiting ten years for the medical profession to get its act together. Melatonin is one of the body’s antioxidants — it scavenges several types of reactive ‘free radicals’ that damage almost any biological structure they touch: DNA, proteins, fats, and other molecules. The antioxidant functions of melatonin appear to be unrelated to its hormonal functions — it simply happens to have a dual functionality. Glaucoma is a neurodegenerative disease, often associated with raised intraocular pressure that damages the optic nerve. Worldwide, it is the second leading cause of blindness. The loss of vision usually occurs gradually and is often only recognized when the disease is quite advanced. Once lost, the damaged visual field can never be recovered. Is melatonin useful for the conditions and purposes mentioned above? We aren’t allowed to tell you, so you should take a look at some of the references cited here, and then decide for yourself.